Hepatitis C virus (HCV) infection is a major cause of chronic liver disease, usually resulting in persistent infection involving hepatic steatosis, cirrhosis, and hepatocellular carcinoma via escape of the host’s immune response. Set7 is a lysine-specific methyltransferase that is involved in gene regulation and virus replication. However, the mechanism underlying the immune evasion between HCV and Set7 is not well understood. 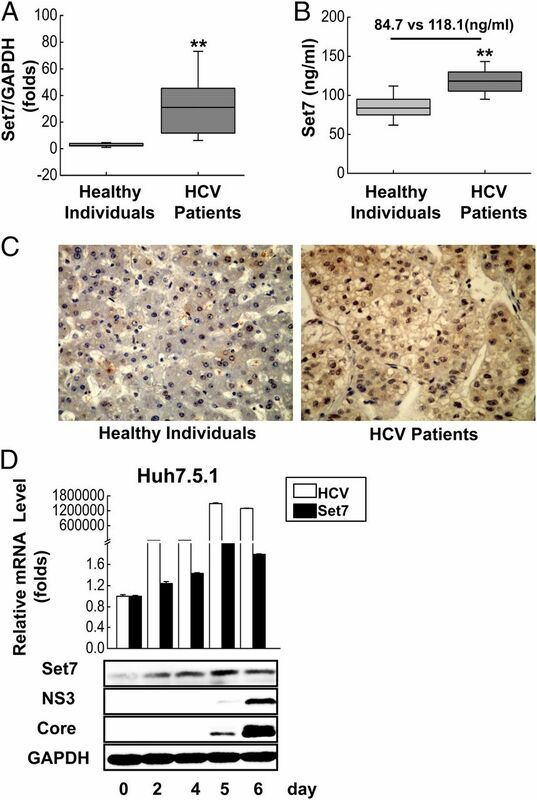 In this study, we observed that the expression of Set7 in Huh7.5.1 cells was upregulated by HCV infection, and high levels of Set7 expression were also found in the sera, PBMCs, and liver tissue of HCV patients relative to healthy individuals. Further investigation showed that Set7 enhanced HCV replication in an enzymatic activity–dependent manner. Moreover, our data showed that Set7 decreased the expression of virus-induced IFN and IFN-related effectors, such as dsRNA-activated protein kinase and 2′,5′-oligoadenylate synthetase. Further investigation suggested that Set7 suppressed the endogenous IFN expression by reducing the nuclear translocation of IFN regulatory factor 3/7 and the p65 subunit of NF-κB and reduced IFN-induced dsRNA-activated protein kinase and 2′,5′-oligoadenylate synthetase via attenuation of the phosphorylation of STAT1 and STAT2. Additionally, IFN receptors, including IFNAR1 and IFNAR2, which are located upstream of the JAK/STAT pathway, were reduced by Set7. Taken together, our results reveal that Set7 facilitates HCV replication through the attenuation of IFN signaling pathways and IFN-related effectors. Hepatitis C virus (HCV) was first discovered as non–A, non–B hepatitis in 1989. To date, ∼130–170 million people are estimated to be infected with HCV worldwide (1, 2). HCV infection is recognized as a major cause of chronic liver disease and usually causes persistent infection, leading to hepatic steatosis, cirrhosis, and hepatocellular carcinoma (3). HCV is a small and enveloped RNA virus belonging to the Hepacivirus genus of the Flaviviridae family (4). The HCV genome carries a single plus-strand RNA of ∼9.6 kb, which contains a single open reading frame encoding a polyprotein precursor of ∼3000 aa residues. The polyprotein is cleaved co- and posttranscriptionally by host and viral proteases into at least 10 distinct proteins, including 4 structural proteins named core, E1, E2, and p7 (a small cation channel protein) and 6 nonstructural proteins named NS2, NS3, NS4A, NS4B, NS5A, and NS5B (5). Innate and adaptive immune responses play an essential role for the host during virus infection. Upon infection, virus components are recognized by host cells; subsequently, activated host cells release antiviral cytokines IFNs and proinflammatory cytokines to inhibit viral replication. IFN-α therapy is a common strategy for HCV infection in clinics, and the antiviral response of IFN-α relies on the activation of the IFN/JAK/STAT pathway. The production of many executors of the antiviral response depends on this pathway, including, for example, dsRNA-activated protein kinase (PKR) and 2′,5′-oligoadenylate synthetase (OAS) (6, 7). However, only 10–20% of patients with chronic HCV infection have a sustained response rate after IFN-α monotherapy (8). Much evidence has shown that HCV can maintain its chronic and persistent infection via escape of the host’s immune response. Although the exact molecular mechanisms of the immune evasion of HCV are not well understood, much evidence has suggested that IFN and IFN-related pathways can be attenuated by the HCV gene products. For example, both HCV NS3/4A and NS4B can decrease the expression of IFN-β by influencing retinoic acid–inducible gene I signaling (9, 10); however, NS5A and E2 inhibit the antiviral response of IFN by their interaction with PKR (11, 12). Additionally, both HCV core and NS5A can disrupt the IFN-related pathway by interaction with STAT1 (13). Gene transcription and activation are a dynamic regulation processes by chromatin modification. Histone acetylation usually caused gene transcription activation, whereas histone methylation is associated with either gene activation or repression. Recently, several histone methyltransferases, including the Suv39, G9a, and SET1/2 families, have been identified (14–16). These genes can activate or repress related gene expression by methylation of different lysine sites of histone H3, which is correlated with different forms of chromatin formation (17). Set7 (18), also called Set9 (19) or Set7/9 (20), was originally isolated from HeLa nuclear extracts. Structural and biochemical studies have indicated that Set7 is a 45-kDa lysine-specific methyltransferase containing a SET domain encoded by a gene conserved in vertebrates (21). Posttranslational modifications of proteins, such as histone modification or non–histone modification, play an important role in gene regulation. In recent years, several studies have demonstrated that the expression of a specific gene can be regulated by protein methyltransferase via chromatin modification. For example, Set7 could regulate chromatin state and increase the expression of many genes by methylated histone protein H2A, H2B, and H3 (22, 23). Additionally, recent research has indicated that Set7 can transfer two or three methyl groups to histone H3 lysine 4 to produce dimethylation or trimethylation products, but the function of di- or trimethylation is unclear (22, 24, 25). In addition to histone modification, several recently identified nonhistones have also served as substrates of Set7, including p53, NF-κB subunit p65, retinoblastoma protein, DNA methyltransferase 1 (DNMT1), silent mating type information regulation 2 homolog 1, and STAT3 (24). The methylation of different sites in these proteins can positively or negatively regulate the specific gene expression. All of the above studies have indicated that Set7 methylation plays a role in tumor suppression, cell proliferation, or cell cycle regulation. However, the relationship between Set7 gene expression and viral infection has been investigated only in a few studies. Hsu et al. (26) reported that human papillomavirus E6 attenuated the p53 transactivation function via decreased enzymatic activities of Set7. Another study suggested that DNMT1, which can be methylated by Set7, was required for HCV infection (27). Additionally, Set7 was recently found to promote HIV transcription via monomethylated Tat protein (28). Recent studies showed that the antiviral function of IFN-induced transmembrane 3 protein for vesicular stomatitis virus and influenza A virus could be attenuated by Set7 (29). Taken together, these findings suggested that Set7 may play a role in virus infection or replication. Thus, in the present study we investigated the relationship between Set7 and HCV replication and the molecular mechanisms underlying such a correlation. In this study, our data show that the expression of Set7 is increased by HCV infection in both cell culture and HCV patients. In turn, the induced Set7 promotes HCV replication in an enzymatic activity–dependent way. Further studies reveal that Set7 facilitates HCV replication via attenuation of the IFN/JAK/STAT pathway, and the action of Set7 may be regulated by the signaling of multiple cellular factors, including IFNAR1, IFNAR2, STAT1, and STAT2. Peripheral blood specimens were obtained from 30 patients with chronic HCV infection (12 males and 18 females with a mean age of 40.7 ± 13.2 y) in Hubei Province, China. All patients were confirmed to be HCV+ and were negative for concomitant hepatitis B virus, hepatitis D virus, or HIV infection. The patients did not have any concomitant disease at the moment of sample collecting, did not show any serological markers suggestive of autoimmune disease, and had not received any antiviral or immunomodulatory therapy prior to the present study. Matched by gender and age, 30 HCV− individuals (13 males and 17 females with a mean age of 42.9 ± 14.1 y) with no history of liver disease were randomly selected from a local blood donation center as controls. The detailed information of the population used in this study is described in Supplemental Table 1A–C. The study was conducted according to the principles of the Declaration of Helsinki and was approved by the Institutional Review Board of the College of Life Sciences, Wuhan University, in accordance with the guidelines for the protection of human subjects. Written informed consent was obtained from each participant. The pEGFP-Set7 and pEGFP-Set7(H297A) plasmids were provided by Prof. Wei-Guo Zhu of Peking University (Peking, China). Coding regions of Set7 or Set7(H297A) were generated by PCR amplification using the pEGFP-Set7 or pEGFP-Set7(H297A) plasmid as a template and then the PCR products were digested with BamHI/HindIII and cloned directly into either the pCMV-Tag2B or pET28a(+) expression vector to generate flag-tagged pCMV-Set7, pCMV-Set7(H297A), and pET28a-Set7. A fragment of the Set7 promoter (−1648 bp) was amplified from human genomic DNA and subcloned into a pGL3-promoter vector. The truncation of the promoter (−679 bp, −527 bp) was amplified from this construct and subcloned into the same empty vector. Differently mutated Set7 promoter constructs were also generated from pGL3-Set7 (−1648 bp) with the QuikChange site-directed mutagenesis kit. All primers used for construction are listed in Supplemental Table 1D. Expression constructs carrying each of HCV genes (E1, E2, core, P7, NS2, NS3, NS3/4, NS4A, NS4B, NS5A, NS5B) were described in Liu et al. (30). All constructs were verified by DNA sequencing. The specific small interfering RNA (siRNA) against Set7 (siSet7) used in this study was purchased from RiboBio (Guangzhou, China). The sequence is based on a previously reported sequence (31) as follows: siRNA-Set7 sense strand, 5′-GGGCACCTGGACGATGACGGA-3′; siRNA–c-Jun sense strand, 5′-GAUGGAAACGACCUUCUAUTT-3′. Huh7.5.1, Huh7, and L02 (normal human hepatic cell line) cells were cultured in DMEM (Life Technologies, Grand Island, NY) supplemented with 10% FCS (Life Technologies), 100 U/ml penicillin, and 100 μg/ml streptomycin sulfate. Cells were maintained at 37°C in a 5% CO2 incubator. The HCV genotype 2a strain JFH-1 was provided by Dr. Takaji Wakita of the National Institute of Infectious Diseases of Japan. Huh7.5.1 cells were infected with JFH-1 at a multiplicity of infection (MOI) of between 0.1 and 5. HCV was propagated for 7 d before collection. Virus stock was obtained after filtering of the cell supernatant. Viral titers were quantified using a commercial kit (HCV RNA qPCR diagnostic kit; KHB, Shanghai, China). Aliquots were stored at −70°C prior to use. Abs against PKR (sc-10037), OAS (sc-98424), p-STAT1 (sc-7988), STAT2 (sc-476), IFN regulatory factor (IRF)3 (sc-9082), IRF7 (sc-9083), p50 (sc-7178), IFNAR1 (sc-7391), IFNAR2 (sc-30014), HCV core protein (sc-52804), Set7 (sc-28113), CREB1 (sc-58), c-Jun (sc-44), and c-Fos (sc-52) were purchased from Santa Cruz Biotechnology (Santa Cruz, CA). The Ab against HCV NS3 (ab65407) and Set7 (ab14820) were purchased from Abcam (Cambridge, U.K.). Abs against Set7 (2813), p-STAT2 (4441S), STAT1 (9172), and p-IRF3 (4947) were purchased from Cell Signaling Technology (Beverly, MA). The Ab against GAPDH was purchased from CoWin Biotech (Beijing, China). Abs against lamin A and p65 were purchased from the Proteintech Group (Wuhan, China). Human IFN-α ELISA Kit (41100-1) was purchased from R&D Systems (Minneapolis, MN). The inhibitor of Set7 enzymatic activity (AMI-5) was purchased from Merck (Darmstadt, Germany), and kinase-specific inhibitors used in this study were purchased from Sigma-Aldrich (St. Louis, MO): U0126 (iERK; 10 mM), H-89 (iPKA; 10 mM), LY294002 (iPI3K; 10 mM), SP600125 (iJNK; 10 mM), Bay11 (iNF-κB; 10 mM), and SB203580 (iP38; 10 mM). All of the inhibitors were dissolved in DMSO (Sigma-Aldrich) upon use. Cells were plated in 24-well plates and grown to ∼80% confluence prior to transfection. The cells were transfected with Lipofectamine 2000 reagent (Invitrogen, Carlsbad, CA) for 24 h and then were serum starved for another 24 h. Luciferase activity was measured using the Dual-Luciferase or Renilla reporter assay system (Promega, Madison, WI) according to the manufacturer’s instructions. Renilla luciferase activities were used as internal controls in the Dual-Luciferase assay system. Virus RNA transcription in vitro and Renilla luciferase activity of FL-J6/JFH5′C19Rluc2AUbi were performed as described previously (32). FL-J6/JFH5′C19Rluc2Aubi was provided by Dr. Charles M. Rice of Rockefeller University. Assays were performed in triplicate, and results are expressed as mean luciferase activities ± SD. For PBMCs, cells were transfected by electroporation according to the manufacturer’s instructions (Nucleofector II; Amaxa, Cologne, Germany). Total RNA was extracted using TRIzol reagent (Invitrogen). Total RNA was reverse transcribed into cDNA using random primers as follows: 30°C for 15 min, 42°C for 60 min, and 72°C for 10 min. Real-time PCR was performed in an Applied Biosystems StepOne real-time PCR system. GAPDH was amplified as an internal control, and the primers used in the current study were as follows: OAS forward, 5′-AAGCCCTACGAAGAATGTC-3′, reverse, 5′-TTCCGTCCATAGGAGCCAC-3′; PKR forward, 5′-AAAGCGAACAAGGAGTAAG-3′, reverse, 5′-GATGATGCCATCCCGTAG-3′; GAPDH forward, 5′-AAGGCTGTGGGCAAGG-3′, reverse, 5′-TGGAGGAGTGGGTGTCG-3′; IFN-α forward, 5′-TTTCTCCT GCCTGAAGGACAG-3′, reverse, 5′-GCTCATGATTTCTGCTCTGACA-3′; IFN-β forward, 5′-TGGGAGGCTTGAATACTGCCTCAA-3′, reverse, 5′-TCCTTGGCCTTCAGGTAATGCAGA-3′; HCV forward, 5′-TCGTATGATACCCGATGCT-3′, reverse, 5′-GTTTGACCCTTGCTGTTGA-3′; Set7 forward, 5′-CGCACG GGTT CTGCACAGTC-3′, reverse, 5′-ATACCCCTCCAGGGTGCTGCC-3′; CEBP/β forward, 5′-AGCGCGGCGACGAGTACAAGATC-3′, reverse, 5′-ACCTTGTGCTGCGTCTCCA-3′; CREB1 forward, 5′-ATTACCCAGGGAGGAGCAAT-3′, reverse, 5′-TGGTTGCTGGGCACTAAGAT-3′; CREB2 forward, 5′-CATTCCTCGATTCCAGCAAAGCAC-3′, reverse, 5′-TTCTCCAACATCCAATCTGTCCCG-3′; c-Jun forward, 5′-CGCCCCTGTCCCCCATCG-3′, reverse, 5′-TGTGCCACCTGTTCCCTG-3′; c-Fos forward, 5′-GGGGCAAGGTGGAACAGTTA-3′, reverse, 5′-GTCTGTCTCCGCTTGGAGTG-3′. To separate the cytosolic and nuclear proteins, cells were washed with ice-cold PBS and then collected by centrifugation at 3000 × g for ∼5 min. The pellets were incubated in two volumes of buffer A [10 mM HEPES (pH 8), 0.5% NP-40, 1.5 mM MgCl2, 10 mM KCl, 0.5 mM DTT, and 200 mM sucrose] for ∼5 min on ice. The nuclei were collected by centrifugation at 12,000 × g for ∼30 s, and the pellets were washed with buffer A again. Next, the above precipitate was resuspended in 1 vol buffer B (20 mM HEPES [pH 7.9], 1.5 mM MgCl2, 420 mM NaCl, 0.2 mM EDTA, and 1.0 mM DTT) and incubated on a shaking platform for 30 min at 4°C. Nuclei were collected by centrifugation at 12,000 × g for 5 min at 4°C, and supernatants were also collected. In the present study, PMSF and cocktail protease inhibitor (Roche, Basel, Switzerland) were added to each type of buffer. Nuclear extracts were stored at −70°C until use. Whole-cell lysates were prepared by lysing cells in a cell lysis buffer (Beyotime, Haiman, China) containing PMSF and cocktail protease inhibitor. Lysates were centrifuged at 12,000 × g for 10 min at 4°C. Protein concentrations were determined using the BCA assay kit (Beyotime, Haiman, China) according to the manufacturer’s instructions. All samples from cell lysates were separated on NaDodSO4/12% polyacrylamide gels and transferred electrically to nitrocellulose membranes. Nonspecific sites were blocked with 3% BSA before being incubated with the indicated Ab used in this study. Blots were developed using SuperSignal chemiluminescent reagent (Millipore, Billerica, MA), and the stained membranes were analyzed by an LAS-4000 image document instrument (FujiFilm, Tokyo, Japan). Serum Set7 was quantified by ELISA assays. Recombinant Set7 protein in this study was expressed and purified using a His-tagged protein purification system (Invitrogen) according to the manufacturer’s instructions. The purified Set7 protein was identified by SDS-PAGE and Western blotting, and then the protein concentration was measured by the BCA method (Beyotime). ELISAs were performed by coating the bottom of a 96-well plate with clinical serum samples overnight at 4°C. The capture Ab was incubated for 2 h at room temperature, and then the plate was washed three times with TBST, followed by incubation with the appropriate HRP-labeled secondary Ab for 1 h and finally washing five times with TBST. ELISAs were developed using the substrate 3,3′,5,5′-tetramethylbenzidine (Sigma-Aldrich), and the absorbance at the double wavelength 450/630 nm was measured. Set7 concentrations were calculated from the standard curve. The level of IFN-α in cell culture medium was measured by an ELISA kit according to the manufacturer’s protocol. The Western blot images were analyzed using Image-Pro Plus 6 software, and the OD values of the protein bands were computed according to the software instructions. Data are presented as means ± SD. All experiments were repeated at least three times with similar results. Representative data are shown. Statistical analyses between experimental groups were performed using paired Student t tests. A p value <0.05 was deemed to indicate statistical significance. To investigate the expression level of Set7 during HCV infection, PBMCs were isolated from 20 HCV patients and 20 healthy individuals (Supplemental Table 1A) and then Set7 mRNA levels were analyzed by real-time PCR. The results showed that Set7 mRNA levels were elevated ∼10-fold higher in HCV patients than in healthy individuals (Fig. 1A). Additionally, Set7 protein levels in the serum of HCV patients (n = 30) were significantly elevated compared with those in healthy individuals (n = 30) (mean ± SEM, 118.1 ± 16.9 versus 84.7 ± 13.6 ng/ml, respectively; Fig. 1B, Supplemental Table 1B). Moreover, the expression of Set7 in liver biopsy specimens from 18 HCV patients and 18 healthy individuals was examined by immunohistochemistry. The results indicated that Set7 levels in HCV patients were significantly higher than those in healthy individuals (Fig. 1C, Supplemental Table 1C). We next examined whether the endogenous expression of Set7 is influenced by HCV infection in cell culture. To explore the kinetics of Set7 induction, Huh7.5.1 cells were infected with the HCV JFH-1 virus at a MOI of 1 as described previously (30, 33). As expected, the mRNA levels (Fig. 1D, upper panel) and protein levels (Fig. 1D, lower panel) of Set7 were increased following HCV replication at various times, and the elevated mRNA and protein levels of Set7 can be detected as early as ∼2 d postinfection. Additionally, we monitored the replication of HCV according to the RNA level (Fig. 1D, upper panel) and protein level (Fig. 1D, lower panel), and the results demonstrated that HCV was replicating in this infectious system. Set7 expression is elevated in vivo and in vitro during HCV infection. (A) Total RNA was extracted from freshly isolated PBMCs from healthy individuals (n = 20) or HCV patients (n = 20). Set7 mRNA levels were measured using real-time RT-PCR. GAPDH was used as an internal control, and the Set7 levels in each sample were normalized by dividing the Set7 quantity by the GAPDH quantity. (B) Set7 levels were detected in the sera of healthy individuals (n = 30) and HCV patients (n = 30). (C) Immunohistochemical staining of Set7 in liver biopsies from healthy individuals (n = 18) and HCV patients (n = 18). (D) Huh7.5.1 cells were infected with JFH1 at an MOI of 1 for different times as indicated. The levels of HCV RNA and Set7 mRNA were detected by real-time PCR, and protein levels were detected by Western blot analyses using appropriate Abs. GAPDH was used as an internal reference. The protein levels of HCV NS3 and core were monitored to ensure viral replication and represented the replication levels of HCV in the cells. The data shown are means ± SE. **p < 0.01. As we known, HCV encodes ∼11 viral proteins. To investigate which viral protein contributes to the induction of Set7, Huh7 cells were cotransfected with each of 11 HCV gene-expressing plasmids and pGL3-Set7. The luciferase activity results showed that HCV p7, NS3, and NS5A protein were able to stimulate Set7 promoter activity significantly (Fig. 2A). Additionally, both real-time RT-PCR and Western blot data indicated that the Set7 mRNA and protein level were increased only by NS3 protein (Fig. 2B). p7 and NS5A did not affect the expression of Set7. Next, we asked what is the mechanism by which NS3 induces Set7. We analyzed the promoter of Set7 using bioinformatic software (http://www.cbrc.jp/research/db/TFSEARCH.html). The results showed that Set7 promoter contains several cis elements, including binding sites for NF-κB, CREB, and AP-1. Then, we constructed a full-length promoter, truncated promoters, and mutated promoters to investigate the key element sites in the regulation process of Set7. Huh7 cells were cotransfected with indicated promoters and NS3 expression plasmids. The results demonstrated that truncation or mutation at the AP-1 site significantly reduced the promoter activity induced by NS3 (Fig. 2C). AP-1, including c-Jun and c-Fos, has been considered as an important transcriptional factor in gene regulation. It activates gene expression either by JNK/c-Jun/AP-1– or ERK1/2/c-Fos/AP-1–dependent pathways (34, 35). We next investigated which pathway plays an important role in the process of Set7 expression. A group of kinase-specific inhibitors were used to screen the signaling pathway involved. The working concentrations of inhibitor have been tested to be noncytotoxic and to have no effect on cell viability. Data showed that the activities of Set7 promoter was significantly reduced in the presence of SP600125 (JNK inhibitor) (Fig. 2D, upper panel); similar results were observed when the protein expression of Set7 was measured by Western blot (Fig. 2D, lower panel). Other inhibitors do not affect Set7 expression in response to NS3 (Fig. 2D). Because SP600125 is the inhibitor of JNK/ c-Jun, we further validated whether c-Jun is involved in this process. The results showed that knockdown of c-Jun significantly decreased Set7 expression not only on promoter levels (Fig. 2E, upper panel) but also on protein levels (Fig. 2E, lower panel). Next, to further validate whether c-Jun signaling is regulated by NS3, we examined the effect of NS3 on c-Jun expression. Results suggested that the mRNA level (Supplemental Fig. 1A) and protein levels (Supplemental Fig. 1B) of c-Jun were upregulated by NS3. In contrast, other transcriptional factors, including CREB and c-Fos, are not influenced by NS3 (Supplemental Fig. 1A, 1B). Interestingly, our results indicated the c-Jun protein levels in the nucleus, but not CREB or c-Fos, were also increased by NS3 (Supplemental Fig. 1C). This finding verified that the change of c-Jun is correlated with the change of Set7 (Supplemental Fig. 1A). Taken together, these data demonstrated that JNK/c-Jun signaling is involved in the upregulation of Set7 in response to NS3. Transcriptional factor c-Jun is involved in the activation of Set7 in response to NS3. (A) Huh7 cells were cotransfected with Set7–luciferase reporter plasmid (pGL3-Set7) and the indicated viral genes or control vector for 48 h prior to luciferase assays. (B) Huh7 cells were transfected with the indicated plasmids for 48 h prior to real-time RT-PCR and Western blot analyses. (C) Constructs of pGL3-Set7 promoter, with a series of truncated or mutated promoters, and pRL-TK were cotransfected with or without NS3 expression plasmid into Huh7 cells; pRL-TK was used as an internal control. Luciferase activity was measured 48 h after transfection. (D) Huh7 cells were treated with the indicated kinase-specific inhibitors for 2 h: NF-κB inhibitor Bay11 (10 μM), PKA inhibitor H-89 (10 μM), ERK inhibitor U0126 (10 μM), JNK inhibitor SP600125 (30 μM), P38 inhibitor SB203580 (10 μM), MEK inhibitor PD98059 (10 μM). pGL3-Set7 and pRL-TK were then cotransfected with or without NS3 expression plasmid into Huh7 cells. Forty-eight hours after transfection, luciferase activity (upper) and protein level (lower) were measured. (E) pGL3-Set7 and pRL-TK were cotransfected with or without NS3 expression plasmid, siNC, or siSet7 as indicated into Huh7 cells. Luciferase activity (upper) and protein level were measured at 48 h after transfection. *p < 0.05, **p < 0.01. To investigate whether the Set7 gene has any effect on HCV replication, we first used an HCV Renilla luciferase reporter virus named FL-J6/JFH5′C19Rluc2AUbi (36, 37), which was derived from the infectious genotype of the 2a J6/JFH chimeric virus (36). Huh7.5.1 cells were infected with FL-J6/JFH5′C19Rluc2AUbi and were subjected to overexpression or knockdown of Set7. Renilla luciferase activities were determined at 48 h after transfection. The results showed that luciferase activity was increased significantly when Huh7.5.1 cells were transfected with pCMV-Set7(wild-type [WT]) (Fig. 3A, upper panel) but reduced significantly when Huh7.5.1 cells were transfected with siSet7 (Fig. 3B, upper panel). Additionally, the overexpression efficiency (Fig. 3A, lower panel) and knockdown efficiency (Fig. 3B, lower panel) of Set7 were identified by Western blotting. Set7 was originally identified as a protein methyltransferase (18, 19), and its enzyme activity is necessary for the methylation of many proteins, including histone or nonhistone proteins (18, 19, 38). Thus, we sought to determine whether the enzyme activity of Set7 is important for HCV replication. Huh7.5.1 cells were infected with the HCV reporter virus and then transfected with Set7(H297A), a mutant of Set7 with deficient enzymatic activity. The results showed that the luciferase activity was not changed when Huh7.5.1 cells were transfected with Set7(H297A) (Fig. 3C, upper panel). The overexpression efficiency of Set7(H297A) was identified by Western blotting (Fig. 3C, lower panel). According to previous reports, AMI-5 is an inhibitor of the enzymatic activity of Set7. Thus, we next tested whether HCV replication is affected by the treatment of AMI-5. As shown in Fig. 3D, the luciferase activity in AMI-5–treated cells was reduced compared with that in nontreated cells, and the total amount of Set7 (Fig. 3D, lower panel) was not changed by the inhibitor. To exclude the interference caused by the chosen virus, we next examined whether Set7 also plays an important role in the replication of the JFH1 virus, which is a common genotype 2a HCV strain (33, 39) that can replicate efficiently in Huh7.5.1 cells. First, we infected Huh7.5.1 cells with the JFH1 virus for 4 d and then transfected them with Set7(WT) or siSet7. The HCV NS3 and core protein levels were used as markers of HCV replication. The results showed that not only the HCV RNA levels (Fig. 3E, upper panel) but also the NS3 and core protein levels (Fig. 3E, lower panel) were increased significantly in Set7(WT)-transfected cells. However, these RNA and proteins levels were reduced significantly in siSet7-transfected cells (Fig. 3F). Similar results were observed in human normal hepatic L02 cells (Supplemental Fig. 2A, 2B). These results were in agreement with the study of the reporter virus as mentioned above. IFN-α protein expression in L02 cells was also measured by an ELISA kit. As shown in Supplemental Fig. 2C, the IFN-α level in L02 cells infected with or without HCV is ∼120 versus 40 pg/ml, respectively. Additionally, we tested the effect of enzymatic activity in the HCV JFH1 replication system. As expected, HCV RNA (Fig. 3G, upper panel) and protein levels (Fig. 3G, lower panel) were not changed by Set7(H297A) significantly compared with vector control, and both HCV RNA and protein expression were decreased in inhibitor-treated cells (Fig. 3H). Thus, we speculated that enzyme activity is very important for HCV replication. Taken together, these results suggest that Set7 can promote HCV replication in an enzymatic activity–dependent manner. Set7 expression facilitates HCV replication. (A) Huh7.5.1 cells were cotransfected with FL-J6/JFH5′C19Rluc2Aubi RNA along with pEGFP or pEGFP-Set7(WT), and luciferase activities were measured at 48 h posttransfection. Huh7.5.1 cells were transfected with pEGFP or pEGFP-Set7(WT). The expression level of Set7 was determined by Western blotting at 48 h posttransfection. (B) Experiments were performed as in (A) except cells were transfected with siNC or siSet7. (C) Experiments were performed as in (A) except cells were transfected with pCMV-Set7(H297A) or control vector. (D) Experiments were performed as in (A) except cells were treated with different concentrations of AMI-5, which was used as an inhibitor of Set7. (E) Huh7.5.1 cells were infected with JFH1 at an MOI of 1. After 4 d of infection, cells were transfected with the indicated overexpression gene. (F and G) Experiments were performed as in (E) except cells were transfected with siSet7 or siNC (F) and pCMV-Set7(H297A) or control vector (G). (H) Experiments were performed as in (E) except cells were treated with 1 μm AMI-5. RNA levels were detected by real-time PCR using the indicated primers, and protein levels were determined by Western blotting using appropriate Abs at 48 h posttransfection or 24 h posttreatment. HCV NS3 and core represent the level of HCV replication. *p < 0.05. no sign., no significance. As shown in the above results, Set7 can enhance HCV replication. However, what is the mechanism underlying this event? Does Set7 play a role in the IFN pathway during viral replication? We next studied whether the overexpression of Set7 can influence the IFN pathway as mentioned above. First, we tested the effect of overexpression of Set7(WT) and Set7(H297A), knockdown of Set7, and the Set7 inhibitor AMI-5 on cell viability. Our results demonstrated that none of these factors could influence the growth of Huh7.5.1 and Huh7 cells significantly (data not shown). Next, we explored whether the IFN pathway was affected by Set7 using promoter-luciferase reporter assays. The results indicated that expression of Set7(WT) inhibited Sendai virus (SeV)–induced IFN-β (Fig. 4A), NF-κB (Fig. 4B), and IFN-stimulated response element (ISRE) (Fig. 4C) promoter activity. 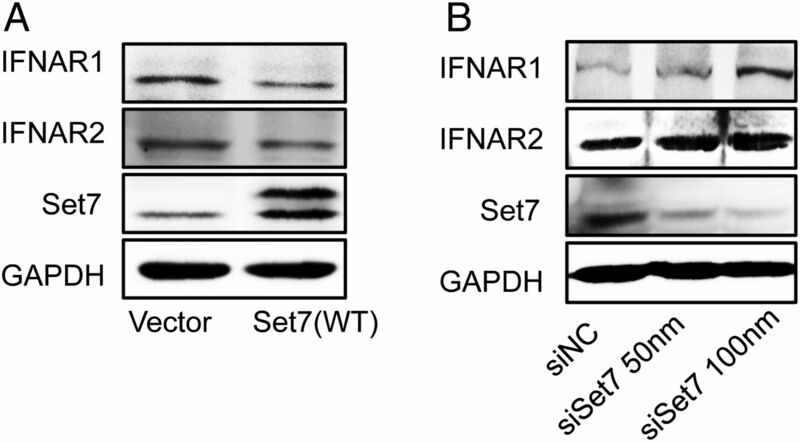 Consistently, knockdown of Set7 by siSet7 increased SeV-induced IFN-β (Supplemental Fig. 3A), NF-κB (Supplemental Fig. 3B), and ISRE promoter activity (Supplemental Fig. 3C). We further investigated whether Set7 affected the expression of endogenous IFN. Huh7 cells were transfected with pCMV-Set7(WT) or pCMV-Set7(H297A) or control vector, siSet7, or irrelevant nonsense (negative control) siRNA (siNC), or they were treated with the inhibitor AMI-5, followed by stimulation with or without SeV for 15 h before harvesting cells. The endogenous mRNA levels were determined by quantitative PCR. 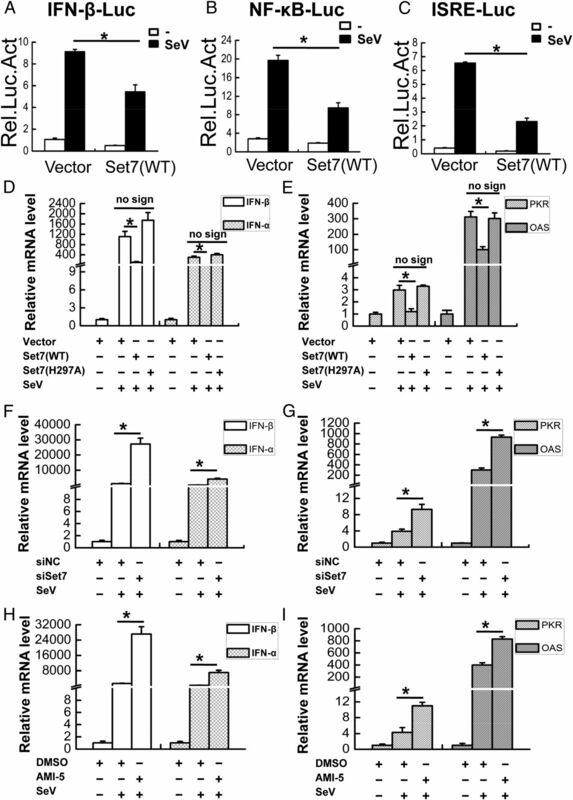 The results showed that overexpression of Set7(WT) could inhibit virus-induced mRNA expression of IFN-β or IFN-α ∼10- or 15-fold, respectively (Fig. 4D). In contrast, overexpression of Set7(H297A) had no effect on virus-induced mRNA expression of IFN-β and IFN-α (Fig. 4D). However, knockdown of Set7 using siRNA or inhibition of Set7 enzymatic activity using AMI-5 enhanced the mRNA expression of IFN-β and IFN-α ∼20- and 15-fold (Fig. 4F) or 20- and 20-fold (Fig. 4H), respectively. Many studies have shown that the antiviral efficiency of IFNs depends on direct antiviral actions through transcriptional activation of many IFN-stimulated genes (ISGs). Two ISGs, encoding OAS and PKR, have been reported to inhibit HCV replication in several studies (40–44). Thus, we further determined whether the expression of these two ISGs was regulated by Set7 during viral infection. As shown in Fig. 4E, the mRNA levels of PKR and OAS were decreased in the presence of Set7(WT). They were reduced ∼2- and 3-fold, respectively. In contrast, overexpression of Set7(H297A) had no effect on virus-induced mRNA expression of PKR and OAS (Fig. 4E). Consistently, the mRNA levels of PKR and OAS (Fig. 4G, 4I) were increased in the presence of siSet7 or AMI-5. Our results demonstrate that Set7 negatively regulates not only virus-induced expression of IFNs but also the expression of IFN-related downstream effectors, and this regulation is dependent on Set7 enzymatic activity. Set7 facilitates HCV replication via attenuation of the IFN pathway. (A) Set7 inhibits SeV-induced activation of the IFN-β promoter. Huh7 cells were transfected with an IFN-β promoter reporter and control vector or the Set7(WT) overexpression plasmid. Eighteen hours after transfection, cells were left uninfected or were infected with SeV for 12 h before luciferase assays were performed. 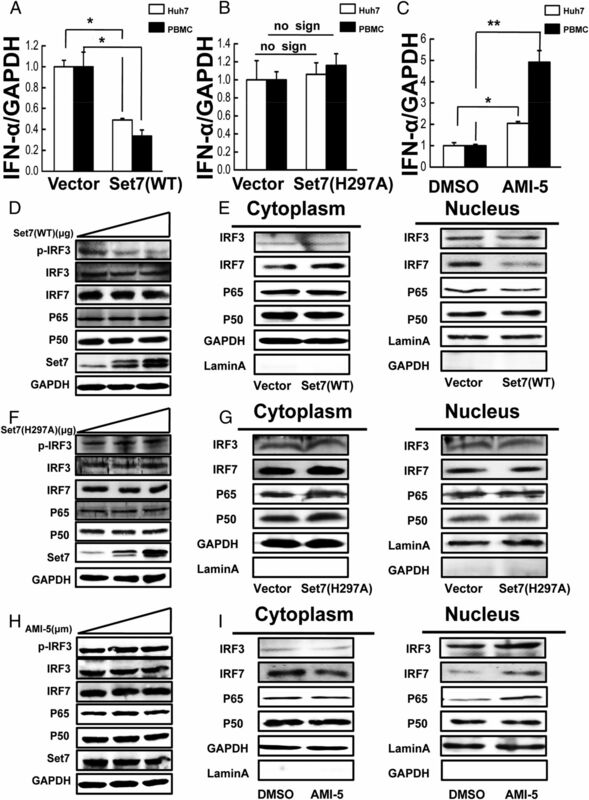 (B) Set7 inhibits SeV-induced activation of the NF-κB promoter. Experiments were performed similarly as in (A) except that an NF-κB reporter was used. 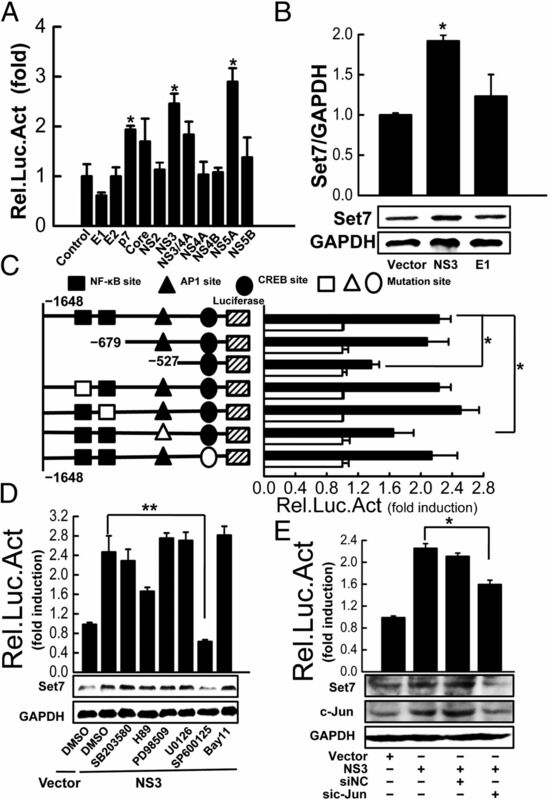 (C) Set7 inhibits SeV-induced activation of the ISRE promoter. Experiments were performed similarly as in (A) except that an ISRE reporter was used. (D) Set7 influences SeV-induced expression of IFN-β and IFN-α mRNA. Huh7 cells were transfected with control vector or the Set7(WT) or Set7(H297A) expression plasmid. Eighteen hours after transfection or 24 h after treatment, cells were infected with or without SeV for 15 h before real-time PCR was performed. (E) Set7 influences SeV-induced expression of PKR and OAS mRNA. Experiments were performed as in (D) except that the mRNA level of PKR and OAS was determined by real-time PCR. (F and G) Set7 influences SeV-induced expression of IFN-β and IFN-α (F) and PKR and OAS (G) mRNA. Experiments were performed similarly as in (D) and (E) except that cells were transfected with siNC or siSet7. (H and I) Set7 affects SeV-induced expression of IFN-β and IFN-α (H) and PKR and OAS (I) mRNA. Experiments were performed similarly as in (D) and (E) except that cells were treated with or without AMI-5. *p < 0.05. no sign, no significance. IFN-α and IFN-α/ribavirin combination therapies are the most common curative strategies for HCV infection (45, 46). Our above results indicated that Set7 can facilitate HCV replication by inhibited SeV-induced IFN expression. Thus, we further determined whether Set7 was involved in the basal regulation of endogenous IFN-α. Huh7 cells and PBMCs were transfected with Set7(WT) or Set7(H297A) or were treated with AMI-5. Real-time PCR analyses were performed at 48 h after transfection or treatment. The results suggested that the mRNA level of IFN-α was inhibited by Set7(WT) in Huh7 cells and PBMCs (Fig. 5A) but was increased by AMI-5 treatment (Fig. 5C). We also found that the protein level of IFN-α was increased by AMI-5 treatment (Supplemental Fig. 2D). However, the mRNA level of IFN-α was not affected by Set7(H297A) in Huh7 cells and PBMCs (Fig. 5B). NF-κB and IRF3/7 were reported to be required for the activation of type I IFNs, and NF-κB activity was shown to be negatively regulated by Set7 (47, 48). To this end, we first transfected different concentrations of the indicated expression vector into Huh7 cells. Forty-eight hours after transfection, the IRF3, IRF7, p65, and p50 protein levels were measured by Western blotting. The results indicated that the protein levels of all these proteins from whole-cell lysates were not influenced by Set7(WT) except p-IRF3 (Fig. 5D). We further examined the translocation state of these proteins in the cytosol and nucleus. The results showed that the protein levels of IRF3, IRF7, and p65 were increased significantly in the cytosol (Fig. 5E, left) and decreased in the nucleus (Fig. 5E, right) in Set7(WT)-transfected cells. At the same time, we also examined the role of Set7 enzymatic activity in IFN regulation. Our data demonstrated that the total protein levels of IRF3, IRF7, p65, and p50 were not influenced by either Set7(H297A) (Fig. 5F) or AMI-5 (Fig. 5H). However, in AMI5-treated cells, the protein levels of IRF3, IRF7, and p65 were downregulated in the cytosol (Fig. 5I, left panel) and upregulated in the nucleus (Fig. 5I, right panel), and the p50 protein level did not change in the nucleus and cytosol with Set7(WT) transfection or treatment with AMI-5 (Fig. 5E, 5I). Additionally, all protein levels were not changed by Set7(H297A) in cytosol (Fig. 5G, left panel) and nucleus (Fig. 5G, right panel). Because phosphorylation of IRF3 is a marker of nuclear translocation, the IRF3 translocation results are unclear. Thus, we determined the effect of Set7(WT) on the expression of p-IRF3. As expected, the expression of p-IRF3 was reduced by Set7(WT) in a dose-dependent manner (Fig. 5D), not changed by Set7(H297A) (Fig. 5F), and was upregulated by AMI-5 (Fig. 5H). These results are also consistent with those using nuclear extracts. Additionally, to examine the purity of cytosolic and nuclear extracts, we detected GAPDH levels in the nuclear and lamin A levels in the cytosolic fractions, respectively. As shown in Fig. 5E, 5G, and 5I, GAPDH was not able to be detected in nucleus and neither was lamin A in cytosol. Taken together, these results suggested that Set7 reduced the translocation of IRF7 and p65 into the nucleus and subsequently inhibited the expression of endogenous IFN-α in an enzymatic activity–dependent manner. 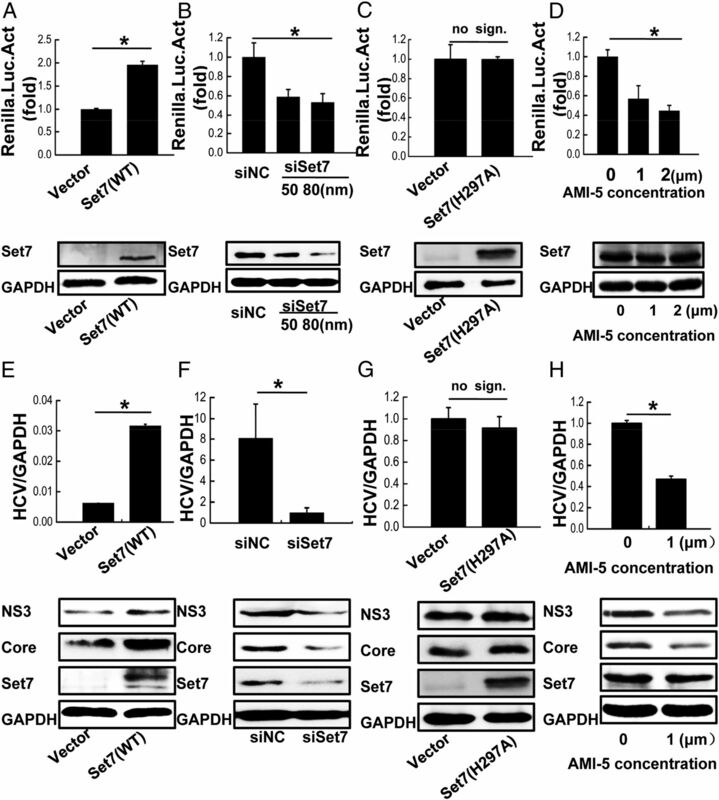 Set7 can suppress the expression of endogenous IFN-α through blockade of the nuclear translocation of IRF-7 and NF-κB. (A) Huh7 and PBMCs were transfected with control vector or Set7(WT). Forty-eight hours after transfection, the mRNA levels of IFN-α were analyzed by real-time PCR. (B) Experiments were performed as described in (A) except cells were transfected with control vector or Set7(H297A); no sign, no significance. (C) Experiments were performed as described in (A) except cells were treated with DMSO or AMI-5. (D) Huh7 cells were transfected with different amounts of Set7(WT). Forty-eight hours after transfection, the expression of different proteins were analyzed by Western blotting using the indicated Abs. (E) Huh7 cells were transfected with control vector or Set7(WT). Nuclear and cytosolic fractions of transfected cells were prepared at 48 h posttransfection and analyzed by Western blotting. (F–I) Experiments were performed as described in (D) and (E) except cells were transfected with control vector or Set7(H297A) and treated with DMSO or AMI-5. *p < 0.05, **p < 0.01. no sign, no significance. Previous studies have shown that HCV is very sensitive to IFN-α (49, 50). Presently, IFN-α alone or in combination with ribavirin is the most common and effective therapy strategy for HCV (51, 52). However, ∼10–20% of persons infected with HCV genotypes 2 or 3 are insensitive to curative IFN-α therapy (45, 46). Additionally, many studies have shown that the antiviral efficiency of IFN-α depends on direct antiviral actions through the transcriptional activation of many ISGs. Several IFN-induced effectors, including PKR and OAS, have been demonstrated to inhibit HCV replication (32, 53). Our above results showed that the SeV-induced mRNA of both PKR and OAS were inhibited by Set7. To verify the effect of Set7 on IFN-α–induced ISGs, Huh7 cells were transfected with the indicated overexpression vector or siRNAs or were treated with AMI-5 for 24 h, followed by treatment with or without 900 IU/ml IFN-α for another 24 h. The mRNA and protein levels of PKR and OAS were then measured by real-time PCR and Western blotting, respectively. As expected, Set7(WT) inhibited the mRNA expression level of IFN-α–induced PKR (Fig. 6A, first panel) and OAS (Fig. 6B, first panel) as well as their protein expression levels (Fig. 6C). In contrast, the mutant of Set7 had no significant effect on the mRNA (Fig. 6A, 6B, third panel) and protein (Fig. 6E) expression of IFN-α–induced PKR and OAS. However, Set7-specific siRNA and AMI-5 enhanced the IFN-α–induced expression of both at the mRNA (Fig. 6A, 6B, second and fourth panels) and protein levels (Fig. 6D, 6F). We further explored the mechanism by which Set7 inhibits the exogenous IFN-α–induced downstream effectors. The JAK/STAT pathway is involved in the regulation of ISGs, and the model of JAK/STAT signaling has been studied extensively. First, the binding of extracellular ligand and receptor leads to activation of the associated JAK combination, and then transphosphorylated JAKs can phosphorylate downstream substrate STATs, particularly STAT1 and STAT2. Next, the phosphorylated STATs move into the nucleus in the form of homologous or heterologous dimers or more complex oligomers and directly signal to a specific target gene, thus regulating the associated gene transcription (54, 55). Thus, we detected the effect of Set7 on STAT1 and STAT2. Huh7 cells were transfected with the indicated expression vector and then were treated with or without 900 IU/ml IFN-α for 30 min before harvesting. Total levels of STAT1, STAT2, p-STAT1, and p-STAT2 were identified separately by Western blot analyses. The results showed that IFN-α increased the phosphorylation level of STAT1 and STAT2; subsequently, IFN-α–induced p-STAT1 and p-STAT2 levels were decreased significantly in the presence of Set7(WT) (Fig. 6G). Additionally, the total levels of STAT1 and STAT2 were not influenced by IFN-α or Set7(WT) alone, or by the presence of Set7(WT) in combination with IFN-α (Fig. 6G). Taken together, the results indicate that Set7 inhibited the expression of IFN-α–induced downstream effectors, such as PKR and OAS, in an enzymatic activity–dependent manner. Additionally, our results show that Set7 reduced the phosphorylation level of IFN-α–induced STAT1 and STAT2. Determination of the effect and mechanism of Set7 on the expression of IFN-α–induced IFN downstream genes. (A) Set7 influences the IFN-induced expression of PKR. Huh7 cells were transfected with control vector or Set7(WT) and siNC or siSet7, control vector, or Set7(H297A) and treated with DMSO or AMI-5 for 24 h. Cells were then treated with or without IFN-α (900 IU/ml). mRNA levels were measured at 48 h posttransfection by real-time PCR. GAPDH was used as an internal reference: the PKR quantity in each sample was normalized using the GAPDH quantity. (B) Set7 influences the IFN-induced expression of OAS. Experiments were performed as described in (A) except that OAS expression was detected. (C–F) Experiments were performed as described above except that the protein levels of PKR and OAS were detected by Western blotting. GAPDH was used as an internal control. OD values represent OD analysis. (G) Huh7 cells were transfected with control vector or Set7(WT) for 47 h and then treated with or without IFN-α (900 U/ml) for 30 min (for STATs or p-STATs) before cells were harvested. The expression of STAT1, STAT2, p-STAT1, and p-STAT2 was determined by Western blotting. *p < 0.05, **p < 0.01. no sign, no significance. The cellular receptor of the α/β IFNs contains at least two components encoding IFNAR1 and IFNAR2, respectively. Many reports have demonstrated that these two receptors are critical for activation of the IFN-α/JAK/STAT pathway, and the reduction of the cell surface expression of IFN-α influences its antiviral response in many cells (56–59). Thus, considering that Set7 is an upstream effector of STAT phosphorylation, we further determined whether Set7(WT) could influence the expression of IFNAR1 or IFNAR2. As shown in Fig. 7A, Western blot analyses revealed that Set7(WT) downregulated the protein expression levels of IFNAR1 and IFNAR2. Consistently, knockdown of Set7 by specific siRNA increased the protein expression levels of IFNAR1 and IFNAR2 (Fig. 7B). These results indicated that Set7 could influence the expression of type I IFN receptors. Set7 can induce the expression of IFNARs related to the phosphorylation of STATs. (A) Huh7 cells were transfected with control vector or Set7(WT) and (B) siNC or siSet7. Forty-eight hours after transfection, the expression of IFNAR1 and IFNAR2 was determined by Western blotting. In this study, we identified a previously unrecognized mechanism for the role of Set7 in IFN resistance during HCV infection. Our results demonstrate that HCV infection can enhance the expression of Set7 in cell culture and in patients. In turn, the induced Set7 promotes HCV replication through attenuating IFN-related signaling pathways. HCV NS3 is known to regulate cell growth and inflammation by activated c-Jun expression (35, 60). In this study, we also demonstrated that NS3 can upregulate c-Jun expression and increase the nuclear translocation. Moreover, we demonstrate that c-Jun, but not CREB or c-Fos, is involved in induction of Set7 by NS3. It has been reported that lysine methylation at position 4 of histone H3 is important for eukaryotic genomes to activate gene transcription (61, 62), and Set7 can methylate nonhistones, such as p53, NF-κB, DNMT1, and STAT3 (24), which are involved in gene transcription, tumorigenesis, and cell proliferation. Our results show that AMI-5 (an inhibitor of Set7 enzymatic activity) can inhibit HCV replication in a dose-dependent manner, but the mutant form of Set7 has no effect on HCV replication. The results demonstrate that Set7 enzymatic activity is important for HCV replication. It is well known that the anti-HCV function of the JAK/STAT pathway is carried out by many ISGs. Several studies have indicated that these factors, including those encoding OAS and PKR, could inhibit HCV infection (32, 43, 44, 63, 64). In the present study, we showed that overexpression of Set7 inhibited virus-induced IFN-α, IFN-β, PKR, and OAS activation; however, both knockdown of Set7 and inhibition of Set7 enzymatic activity demonstrated reverse effects. The cause may be that IFN-α can activate the JAK/STAT pathway and subsequently upregulate the expression of many ISGs. IFNs are very important for host defense against virus infection, and IFN-α is the common cure strategy for HCV. However, only a 40% cure efficiency for genotype 1 and 80% cure efficiency for genotypes 2 or 3 were demonstrated in HCV patients undergoing therapy with IFN-α and ribavirin (46). In the present study, we showed that the expression of IFN-α could be inhibited by Set7. Activation of IRF3/7 and NF-κB is required for the production of type I IFNs. Our results also indicated that Set7 could reduce the translocation of IRF3 and IRF7 into the nucleus. Additionally, our data suggested that Set7 can attenuate NF-κB promoter activity, and the translocation of p65 into the nucleus can be reduced by Set7; these findings are consistent with the studies of Hu et al. (48) and Yang et al. (47), who proved that Set7 is a negative regulator of p65 (also named RelA). However, this is contrary to the results of Ea et al. (65) and Li et al. (17), who showed that p65 can be positively regulated by Set7. Moreover, Li et al. (17) indicated that Set7 can activate NF-κB–dependent inflammatory genes, and they proved that Set7 is a novel coactivator of p65 and can enhance the recruitment of p65 to the inflammatory gene promoter. One possible explanation for this discrepancy is that Set7 may play a different role in different experimental systems. In the study of Ea et al. (65), K37 of p65 could be directly methylated by Set7 and was restricted to the nucleus following elevated NF-κB–related gene expression in THP1 and HEK293 cells. However, Yang et al. (47) demonstrated that methylation of K314 and K315 of p65 can result in the proteasome-mediated degradation of p65, leading to reduced expression of NF-κB–related genes in U20S and A549 cells. Our results imply that p65 can be modified by Set7 and that the methylation site may be similar to those in U2OS or A549 cells. Additionally, it remains unclear whether other methylation sites in p65 exist. Further studies regarding possible additional Set7-regulated methylation sites in p65 are needed. Many persons infected with HCV are insensitive to exogenous IFN-α. Thus, we further determined whether Set7 has an effect on exogenous IFN-α–induced ISGs. Our results demonstrated that Set7 inhibited the IFN-α–induced expression of PKR and OAS at the mRNA and protein levels, whereas knockdown of Set7 and inhibition of Set7 enzymatic activity had an adverse effect on PKR and OAS. Phosphorylation of STAT1 and STAT2 leads to ISG expression by translocation of these proteins into the nucleus in homologous or heterologous forms. Our results suggested that overexpression of Set7 could decrease the phosphorylation level of STAT1 and STAT2 but not their total levels. IFNARs are known to be direct upstream effectors of signal transduction of the JAK/STAT pathway, which is related to the phosphorylation of STAT1 and STAT2. In the present study, we also demonstrate that the expression levels of IFNAR1 and IFNAR2 are downregulated by overexpression of Set7 and are upregulated by knockdown of Set7. Recent research has demonstrated that STAT1 and STAT2 phosphorylation are impaired by downregulation of the expression of IFNAR1 and IFNAR2 (58). These results are in complete agreement with our data. Additionally, Zhang et al. (32) have suggested that the Ras/Raf/MEK pathway negatively regulates the JAK/STAT pathway by downregulating the expression of IFNAR1 and IFNAR2. We also found that the phosphorylation level of ERK (an indicator of activation of the Ras/Raf/MEK pathway) is upregulated by Set7 (T. Han and Y. Wan, unpublished data). These results suggest that the close relationship among these proteins affected by Set7 needs to be further investigated. Overall, all of the results indicate that Set7 may downregulate the expression of exogenous IFN-α–induced PKR and OAS via disruption of the JAK/STAT pathway by reducing the expression of IFNAR1 and IFNAR2. Disruption of this pathway allows the virus to escape from innate immunity. Thus, our results provide a reasonable argument for the low sensitivity to exogenous IFN-α during HCV infection. In conclusion, we identified a novel function of Set7 during HCV infection. In the present study, we demonstrate that Set7 can reduce the expression of IFNs and IFNARs, resulting in the downregulation of ISGs, such as those encoding OAS and PKR, by influencing the phosphorylation levels of STAT1 and STAT2. Ultimately, all of these events will indirectly facilitate HCV replication via attenuation of the JAK/STAT pathway. Taken together, all findings uncovered a new mechanism for the low sensitivity to IFN cure in HCV patients, and they also disclosed a new method of HCV evasion. It is important that our studies offer a new insight into the immune evasion of HCV and the reasonable drug treatment. We thank Zhong-Shan Hospital (Wuhan University) for generous assistance in collecting samples from healthy individuals and HCV patients. This work was supported by Major State Basic Research Development Program of China Grant 2013CB911102, National Natural Science Foundation of China Grants 81461130019 and 81271821, National Mega Project on Major Infectious Diseases Prevention Grant 2012ZX10004503-004, and by Deutsche Forschungsgemeinschaft Grant TRR60. The funding agencies had no role in the study design, data collection, analysis, decision to publish, or preparation of the manuscript.
. 2013. Hepatitis C virus therapy update 2013. Curr. Opin. Gastroenterol. 29: 243–249.
. 1989. Isolation of a cDNA clone derived from a blood-borne non-A, non-B viral hepatitis genome. Science 244: 359–362.
. 2000. Replication of hepatitis C virus. J. Gen. Virol. 81: 1631–1648.
. 1991. Molecular biology of the hepatitis C viruses: implications for diagnosis, development and control of viral disease. Hepatology 14: 381–388.
. 2004. Structural biology of hepatitis C virus. Hepatology 39: 5–19.
. 2008. Interferon-inducible antiviral effectors. Nat. Rev. Immunol. 8: 559–568.
. 1999. Current and evolving therapies for hepatitis C. Eur. J. Gastroenterol. Hepatol. 11: 1199–1202.
. 2013. Hepatitis C virus NS4B protein targets STING and abrogates RIG-I-mediated type I interferon-dependent innate immunity. Hepatology 57: 46–58. 2005. Control of antiviral defenses through hepatitis C virus disruption of retinoic acid-inducible gene-I signaling. Proc. Natl. Acad. Sci. USA 102: 2986–2991.
. 1999. Inhibition of the interferon-inducible protein kinase PKR by HCV E2 protein. Science 285: 107–110.
. 1997. Evidence that hepatitis C virus resistance to interferon is mediated through repression of the PKR protein kinase by the nonstructural 5A protein. Virology 230: 217–227.
. 2005. Immune evasion by hepatitis C virus NS3/4A protease-mediated cleavage of the Toll-like receptor 3 adaptor protein TRIF. Proc. Natl. Acad. Sci. USA 102: 2992–2997.
. 2005. The SET-domain protein superfamily: protein lysine methyltransferases. Genome Biol. 6: 227.
. 2005. The diverse functions of histone lysine methylation. Nat. Rev. Mol. Cell Biol. 6: 838–849.
. 2008. Role of the histone H3 lysine 4 methyltransferase, SET7/9, in the regulation of NF-κB-dependent inflammatory genes. Relevance to diabetes and inflammation. J. Biol. Chem. 283: 26771–26781.
. 2001. Purification and functional characterization of a histone H3-lysine 4-specific methyltransferase. Mol. Cell 8: 1207–1217.
. 2002. Set9, a novel histone H3 methyltransferase that facilitates transcription by precluding histone tail modifications required for heterochromatin formation. Genes Dev. 16: 479–489.
. 2002. Crystal structure and functional analysis of the histone methyltransferase SET7/9. Cell 111: 105–115.
. 2008. Evolution of SET-domain protein families in the unicellular and multicellular Ascomycota fungi. BMC Evol. Biol. 8: 190.
. 2011. Specificity analysis-based identification of new methylation targets of the SET7/9 protein lysine methyltransferase. Chem. Biol. 18: 111–120.
. 2007. Histone chaperones regulate histone exchange during transcription. EMBO J. 26: 4467–4474.
. 2013. Transcriptional regulation by the Set7 lysine methyltransferase. Epigenetics 8: 361–372.
. 2003. Structure and catalytic mechanism of the human histone methyltransferase SET7/9. Nature 421: 652–656.
. 2012. The HPV E6 oncoprotein targets histone methyltransferases for modulating specific gene transcription. Oncogene 31: 2335–2349.
. 2013. DNA methyltransferases 1 and 3B are required for hepatitis C virus infection in cell culture. Virology 441: 57–65.
. 2010. The cellular lysine methyltransferase Set7/9-KMT7 binds HIV-1 TAR RNA, monomethylates the viral transactivator Tat, and enhances HIV transcription. Cell Host Microbe 7: 234–244.
. 2013. Negative regulation of interferon-induced transmembrane protein 3 by SET7-mediated lysine monomethylation. J. Biol. Chem. 288: 35093–35103.
. 2012. Major vault protein: a virus-induced host factor against viral replication through the induction of type-I interferon. Hepatology 56: 57–66.
. 2011. Methyltransferase Set7/9 regulates p53 activity by interacting with Sirtuin 1 (SIRT1). Proc. Natl. Acad. Sci. USA 108: 1925–1930.
. 2012. 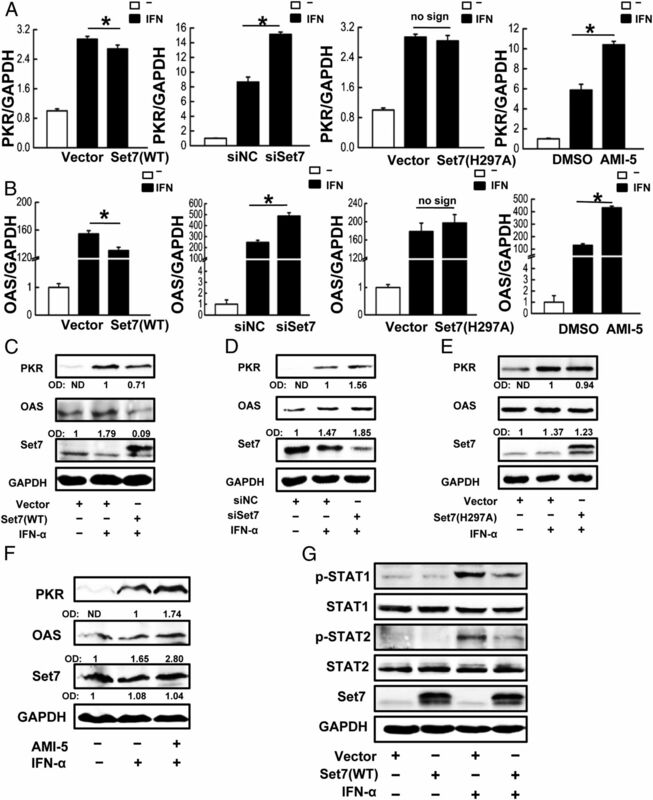 Activation of the Ras/Raf/MEK pathway facilitates hepatitis C virus replication via attenuation of the interferon-JAK-STAT pathway. J. Virol. 86: 1544–1554.
. 2005. Robust hepatitis C virus infection in vitro. Proc. Natl. Acad. Sci. USA 102: 9294–9299.
. 2009. 7β-Hydroxycholesterol and 25-hydroxycholesterol-induced interleukin-8 secretion involves a calcium-dependent activation of c-fos via the ERK1/2 signaling pathway in THP-1 cells: oxysterols-induced IL-8 secretion is calcium-dependent. Cell Biol. Toxicol. 25: 127–139.
. 2005. Activation of c-Jun NH2-terminal kinase (JNK) signaling pathway is essential for the stimulation of hepatitis C virus (HCV) non-structural protein 3 (NS3)-mediated cell growth. Virology 333: 324–336.
. 2005. Complete replication of hepatitis C virus in cell culture. Science 309: 623–626.
. 2006. Time- and temperature-dependent activation of hepatitis C virus for low-pH-triggered entry. J. Virol. 80: 1734–1741.
. 2009. SET7/9 mediated methylation of non-histone proteins in mammalian cells. Epigenetics 4: 383–387.
. 2005. Production of infectious hepatitis C virus in tissue culture from a cloned viral genome. Nat. Med. 11: 791–796. 2003. Alpha interferon induces distinct translational control programs to suppress hepatitis C virus RNA replication. J. Virol. 77: 3898–3912.
. 2002. Activation and evasion of the antiviral 2′-5′ oligoadenylate synthetase/ribonuclease L pathway by hepatitis C virus mRNA. RNA 8: 512–525.
. 2007. Ribavirin up-regulates the activity of double-stranded RNA-activated protein kinase and enhances the action of interferon-α against hepatitis C virus. J. Infect. Dis. 196: 425–434.
. 2004. Hepatitis C virus NS5A protein interacts with 2′,5′-oligoadenylate synthetase and inhibits antiviral activity of IFN in an IFN sensitivity-determining region-independent manner. J. Gen. Virol. 85: 959–969.
. 2007. Hepatitis C virus expression and interferon antiviral action is dependent on PKR expression. J. Med. Virol. 79: 1120–1127.
. 2002. National Institutes of Health Consensus Development Conference statement: management of hepatitis C: 2002—June 10–12, 2002. Hepatology 36(5, Suppl. 1): S3–S20. 2004. Pathophysiology of hepatitis C virus infection and related liver disease. Trends Microbiol. 12: 96–102.
. 2009. Negative regulation of NF-κB action by Set9-mediated lysine methylation of the RelA subunit. EMBO J. 28: 1055–1066.
. 2013. Set9, NF-κB, and microRNA-21 mediate berberine-induced apoptosis of human multiple myeloma cells. Acta Pharmacol. Sin. 34: 157–166.
. 2001. Effect of α interferon on the hepatitis C virus replicon. J. Virol. 75: 8516–8523.
. 2001. Interferon-α inhibits hepatitis C virus subgenomic RNA replication by an MxA-independent pathway. J. Gen. Virol. 82: 723–733.
. 1997. The treatment of chronic viral hepatitis. N. Engl. J. Med. 336: 347–356. 2013. Treatment of chronic hepatitis C: current and future. Curr. Top. Microbiol. Immunol. 369: 321–342. 1990. Interferon-induced proteins and the antiviral state. Adv. Virus Res. 38: 147–200. 2007. The JAK-STAT signaling pathway: input and output integration. J. Immunol. 178: 2623–2629. 2012. The JAK/STAT pathway. Cold Spring Harb. Perspect. Biol. 4: 4.
. 1995. Mutant U5A cells are complemented by an interferon-alpha beta receptor subunit generated by alternative processing of a new member of a cytokine receptor gene cluster. EMBO J. 14: 5100–5108.
. 2001. Down-modulation of type 1 interferon responses by receptor cross-competition for a shared Jak kinase. J. Biol. Chem. 276: 47004–47012.
. 2011. Mechanism of HCV’s resistance to IFN-α in cell culture involves expression of functional IFN-α receptor 1. Virol. J. 8: 351.
. 1993. Identification of a novel subunit of the type I interferon receptor localized to human chromosome 21. J. Biol. Chem. 268: 10895–10899.
. 2008. NS3 protein of hepatitis C virus regulates cyclooxygenase-2 expression through multiple signaling pathways. Virology 371: 61–70.
. 2001. Correlation between histone lysine methylation and developmental changes at the chicken β-globin locus. Science 293: 2453–2455.
. 2001. Transitions in distinct histone H3 methylation patterns at the heterochromatin domain boundaries. Science 293: 1150–1155.
. 2005. Hepatitis C virus core protein down-regulates transcription of interferon-induced antiviral genes. J. Infect. Dis. 191: 93–99.
. 2013. The modulation of hepatitis C virus 1a replication by PKR is dependent on NF-κB mediated interferon β response in Huh7.5.1 cells. Virology 438: 28–36.
. 2009. Regulation of NF-κB activity through lysine monomethylation of p65. Proc. Natl. Acad. Sci. USA 106: 18972–18977.